We popped into town today to volunteer at the Easter Seals Run this morning. The Upper Canada Mall Easter Seals 10k is York Region’s longest running fundraiser for children and youth with physical disabilities. Over the past 40 years this race has raised nearly $3 million to help children and youth with physical disabilities. Team Running Free Newmarket and the Blister Sisters were course marshals, making sure all the runners and walkers were on the right track. It was great to see such a good turn out on such a hot morning for a great cause! Where did June go! Our June Update! Just a little post to update everyone on what we were up to last month. June was a training month for us, lots of running and stretching. 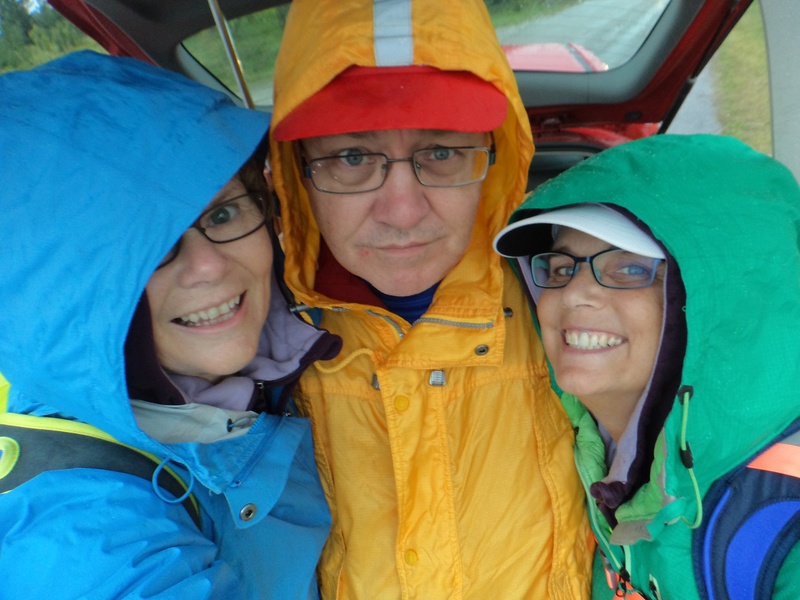 As June is bug month around here and it was pretty rainy, we were on the road a lot, not too much trail time just so we didn’t get eaten alive by the mosquitoes lurking there. We did get involved with the Relay for Life. The Relay for Life is a fund raiser that the Canadian Cancer Society holds to raise money for cancer research and to help fund their outreach programs. We don’t usually fund raise but for this event we did manage to pull it together and raise a few dollars. We decided that everyone who donated to our Blister Sister team would get a thank you gift from us so we knitted up socks, finger less gloves and running hats to give the all great people who donated to our team. The event was held in the evening at a local private school’s track. We walked 17k in the 6.5 hours we spent walking around the track into the early morning. 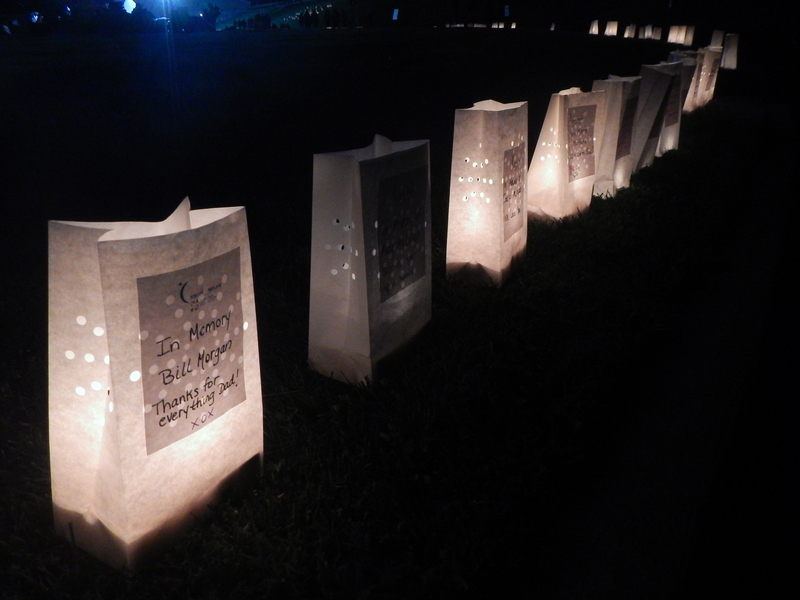 It was particularly inspiring when they lit all the luminaries remembering folks who had passed and those who were survivors. It reminded us that we were doing this not for the ones who had passed but for the people who weren’t even diagnosed yet. This is my dad’s luminary. 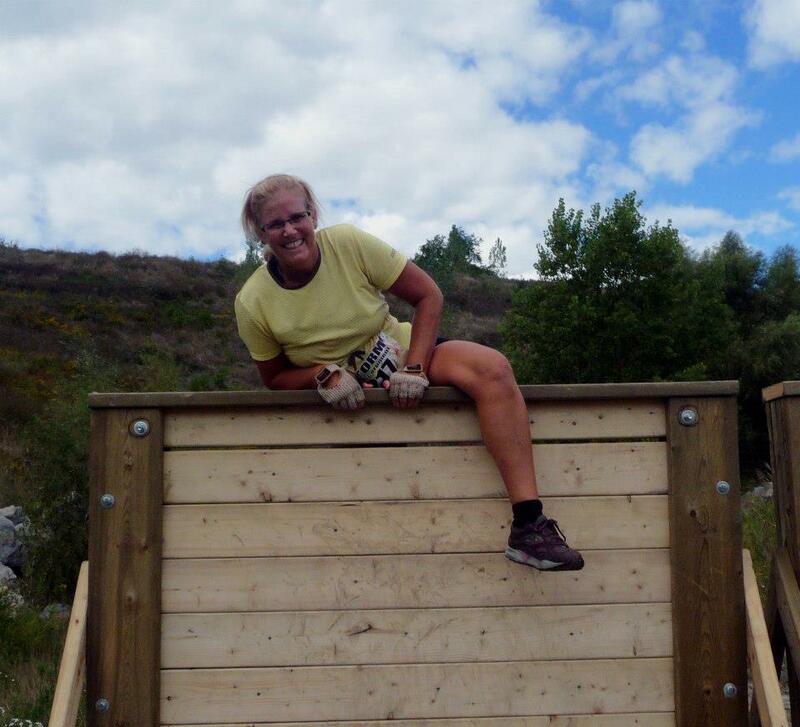 The very next day we were out having a great time volunteering at ESAR – Emergency Services Adventure Race by Storm Events. The race was held this year at Hardwood Hill Ski and Bike Park, the same park that will host the mountain bike portion of the Pan Am games this month. ESAR is comprised of team made of Police, Fire, EMS, Military and Civilian teams. Of course we weren’t actually at this venue, we were some there “out there” at CP2 and 4 checking riders and runners in an out of the check points. Checking in and out of a check point helps the organizers keep track of all the teams. If someone checks in and doesn’t check out, we can only assume they are lost or injured and they need help. Try telling an EMS guy or a cop if they don’t check back in I’m call a search party of their co-workers to go look for them. They soon caught on about the checking in and out of a manned check point. We had great time with everyone. We love volunteering at adventure races. A Blister Sister in action! This weekend we are volunteering at the Rebecca Run. For the last 14 years the Blister Sisters have been there to help out any way we can. 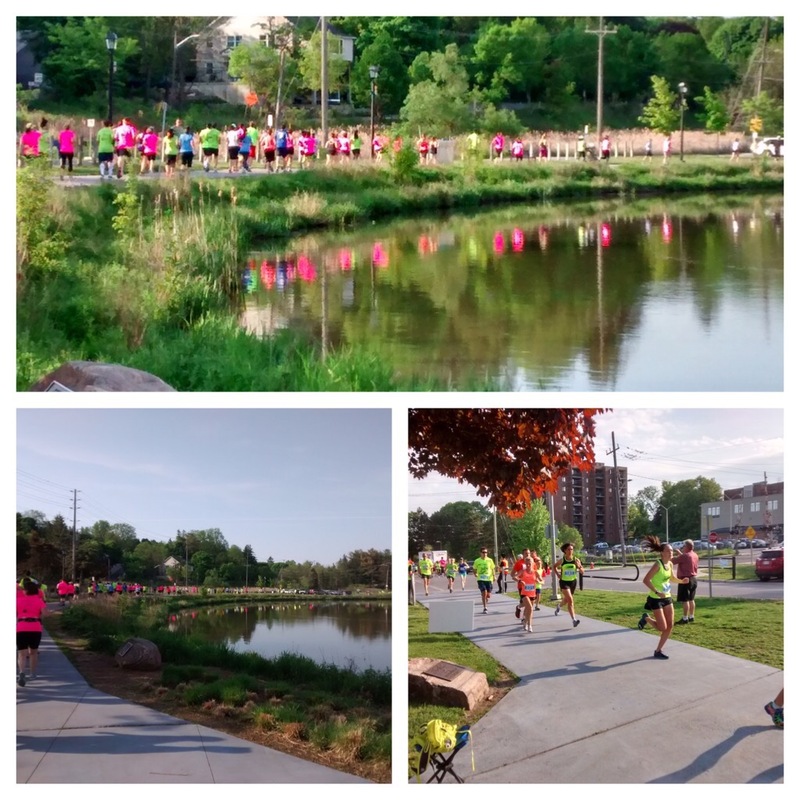 It really is the best little 5k around, family friendly and very inspiring. Check it out. My next volunteering roll with be with the Pan Am Games #Toronto2015. I’m tasked with being a floor manager with the Sports Presentation team at Hardwood Mountain Bike Park. I’ll let you know how that goes. Among all this volunteering we are training. Our next event is the Rock Star Adventure Race. This is our all-time favorite event. There is something about being in the bush with no idea where you are and being able to find your way out that appeals to us (and knowing if we really do get lost someone will come and find us!) With our new found skills with a compass this should be a lot of fun. A race report to come! I had the privilege of participation in the Toronto 2015 Pan Am Games Torch Relay. I carried the torch in my home town, in front of a few great friends last Friday. I was beginning to think I was just not into the whole games thing until I picked up the torch. It really ignited the spirit of the games. Pretty darn cool. When they dropped me at my start point the first person I saw was the other half of the Blister Sisters! It was just awesome that Glenis was there to run with me and the whole time she was filming this wonderful video of my run. It’s a perfect keepsake for me! The video is a little off kilter in places but after all she was running up a hill trying not to trip over any one, what a great memory! Here’s a little about the torch and flame. The torch relay will start in Canada on May 30, 2015, and will make its final stop on July 10, 2015, at the Opening Ceremony of the TORONTO 2015 Pan Am Games. We have a few rules to follow about not setting our hair on fire but that was about it. You’ll notice in the video that I was surrounded by police who ran in a “pod” around me. There was a heavy police presence, about 5 more unmarked cars followed us and there were a few on bikes. I’m sure they weren’t there for me; it was all about that flame! Pretty cool! Work Peeps came out to watch! I’ve have been fortunate in that I was chosen to run in the Pan Am Torch Relay. Starting May 30 and running through to July 10th, about 3000 participants will move the torch though more than 130 communities. The flame will be lit in Teotihuacan, Mexico and travel by 60+ modes of transportation, least of all by me. Now I always thought that torch bearing meant running miles or kilometers along a dreary highway until you see the next lonely long distant torch bearer. Ah Ha! Not so! I am running a mere 240 meters up the only hill in my little town. To top it off I will be dropped off by bus there even though my starting point is only a kilometer from my home! Too funny! I guess I just have to hill train to pull this one off! After I finished chuckling at the absurdity of it, I started to think why I volunteered to do it. This is my only chance to be a part of an international athletic event of this caliber. Never in my wildest dreams would I ever be good enough to compete with these amazing athletes who will be competing in the Pan Am games. This is my chance to shine! 240 meters up a hill, and I will give it my all! Volunteering is very rewarding. Pretty well everyone who volunteers knows that. It’s the feeling that you have made a difference that makes you go back and do it again. We have really enjoyed every event we have volunteered at. We are a little selfish when we volunteer at races. We do it because we are a little jealous of the people who are competing. We just want to be a part of the fun of being there. A great perk is when the competitors thank us for being there. After all, most of these events would be hard to put on without volunteers. We know we are appreciated by the groups we volunteer for. 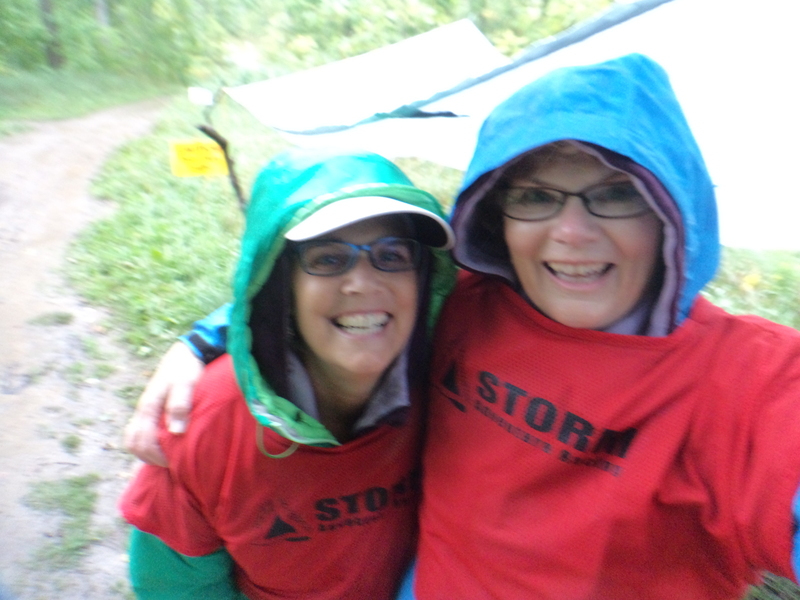 Take a look at the slide show below to see the lengths Heather at Storm the ‘Scarpment went to make sure we stayed dry during the event. We were howling with laughter! Thank you Heather! Cold and rain didn’t dampen the enthusiasm of the participants at the race today. We were a little cold and damp volunteering but watching the efforts of everyone competing was worth the chills. Here we are all smiles! The rain made the trails slick and muddy for the run and ride but that just added to the fun. We just might take on this course next year, hopefully in the sun! Have a look at a few photos we took of the day! Tomorrow Glenis and I along with photographer Phil are volunteering at Storm the ‘Scarpment. 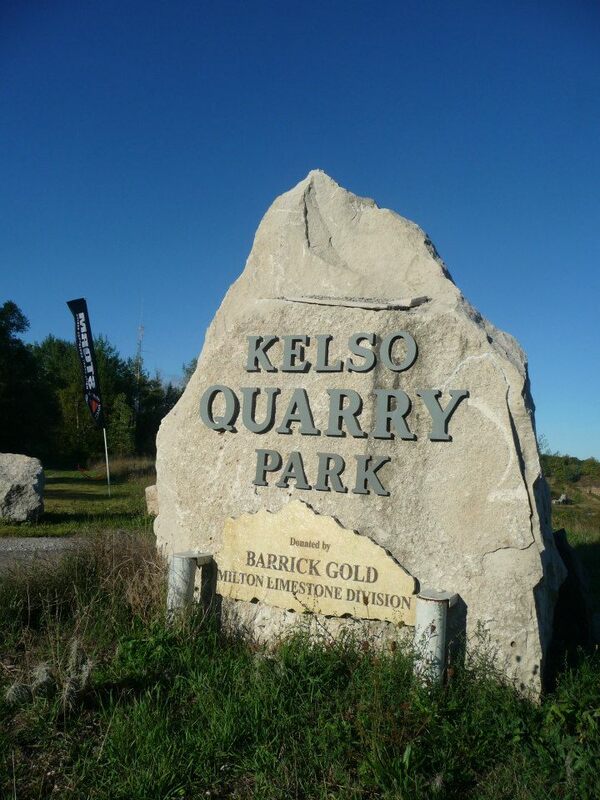 The event is held a Kelso Quarry (at the top of Glen Eden Ski Hill at Kelso Conservation Area in Milton) and involves doing as many loops of an eleven kilometer course as you can in 8 hours. During each loop you will run, ride and paddle. The easy part is that it is a marked course, other than that, nothing is easy about this race. 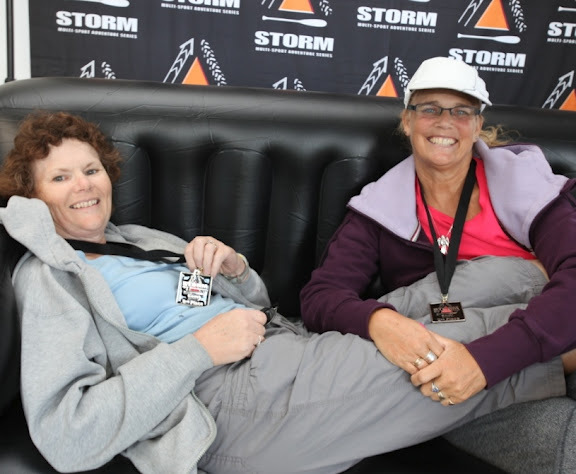 This is an adventure race put on by Storm Events and like most adventure races there are teams. The solo and teams of two work together on each loop they choose to do. There are also teams of 2 and teams of 4 who compete as a tag team with two runners on the course at time. They get a little break between each loop they do. It should be fun to watch the competitors during this event and how they plan out their day. All smiles in the canoe! The Blister Sister did this event a few years ago. It was tough. We managed to get three loops in before we decided we would run out of time if we did a fourth. We did have a blast doing it. 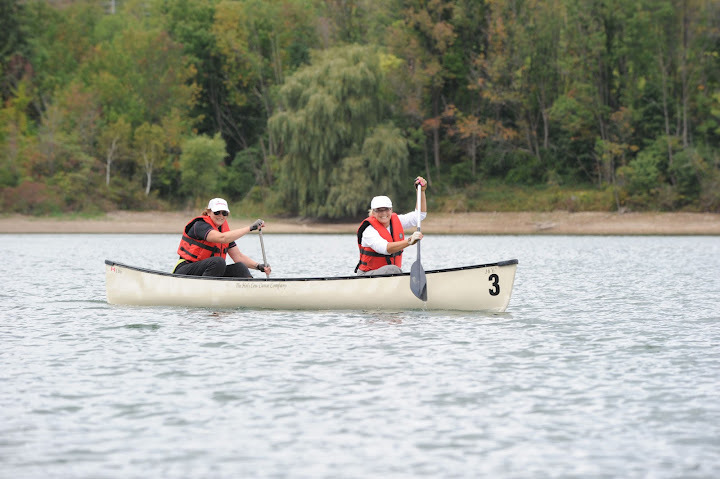 Glenis got dumped in the lake a few times at the canoe transition because I was laughing too hard to steady the boat. We stumbled around the quarry over the obstacles, hiking ourselves over the walls and crawling on our bellies under the netting. The scariest part was the biking portion. Flying down the ski hill was one of the scariest things I have done. Glenis threw caution to the wind and was a kamikaze on the downhill almost taking out some of the maintenance men on the ski lift. It was a awesome day! Oh Yea, we came in second in the team of two females category! Enjoying our 2nd place win!